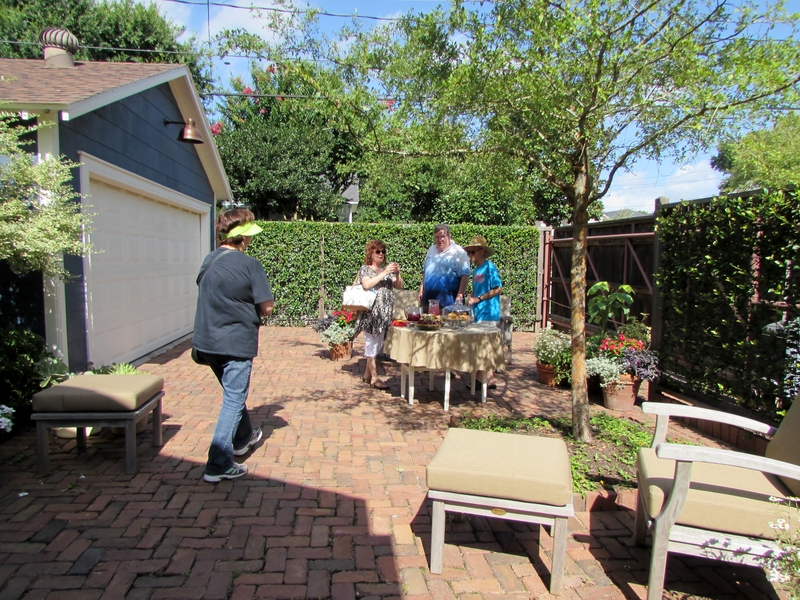 Last year got away from me but as I looked back through my pictures I found these photographs from one of the Heights Garden Club tours. 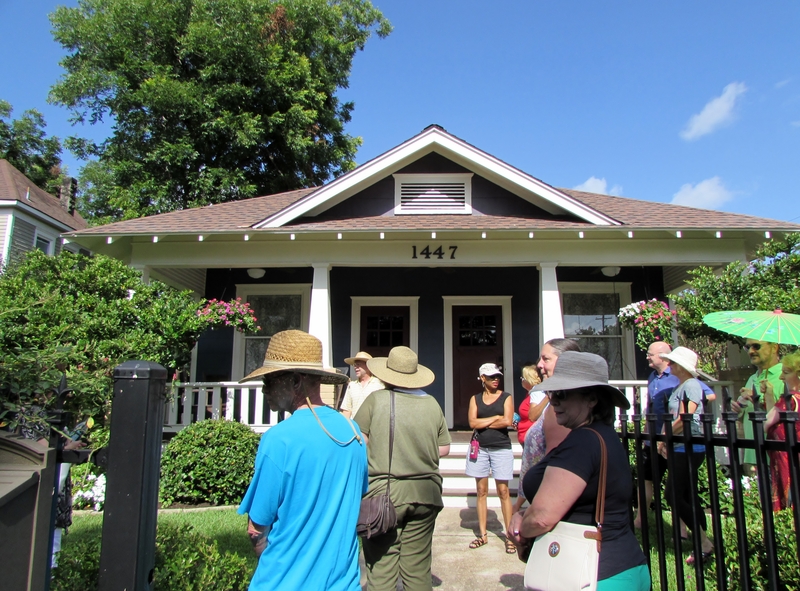 The second Saturday of July took us to the garden of Mark and John here in the Heights. We meet them a couple of years ago when they hired us to worked on a design for a brick driveway, patio and path, a deck extension and way to screen the gate mechanisms. 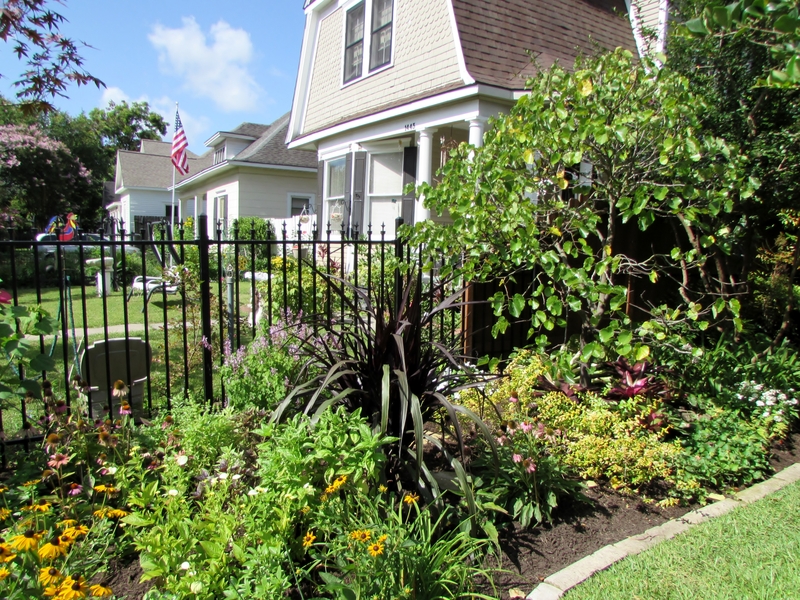 This is one of my favorite cottage gardens in the Heights. It is also a gardeners garden. You who are gardeners know what I mean. Just can’t resit trying one more new plant, moving things around, never really satisfied. I love it! 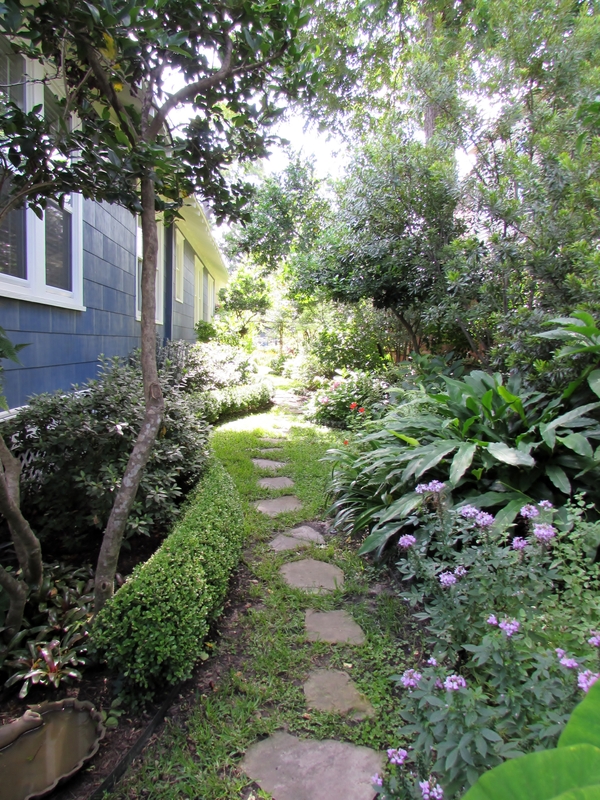 It was a beautiful summer day and the garden was lush after all the rain in May and June. 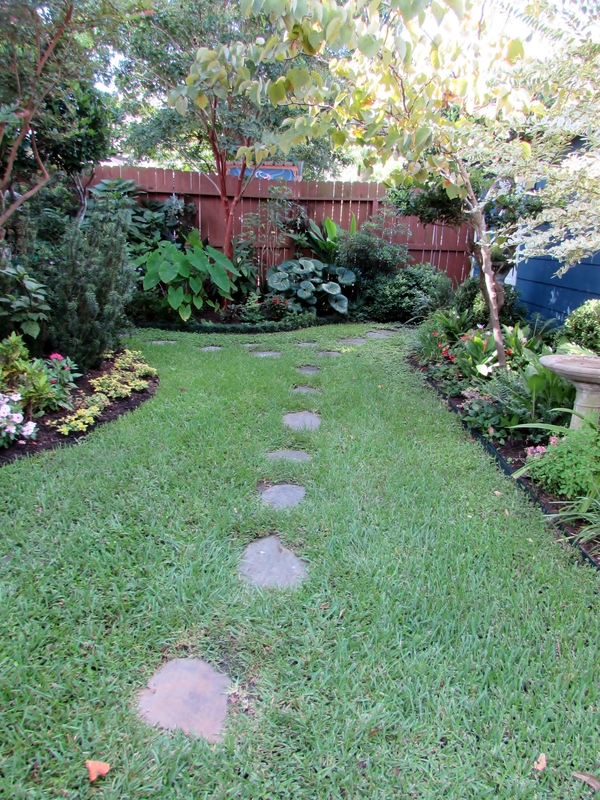 This is a photo of Shawn looking back at the Right of Way garden. I helped with the design here but they have made it so much better and Ravenscourt did install the path that allows better curb access leaving 2 planting ovals. I have consulted with Mark on a couple of occasions the plants choices are mostly his. We believe the tall trees here are Texas Olives trained as patio trees. I love this Weeping Redbud tree. 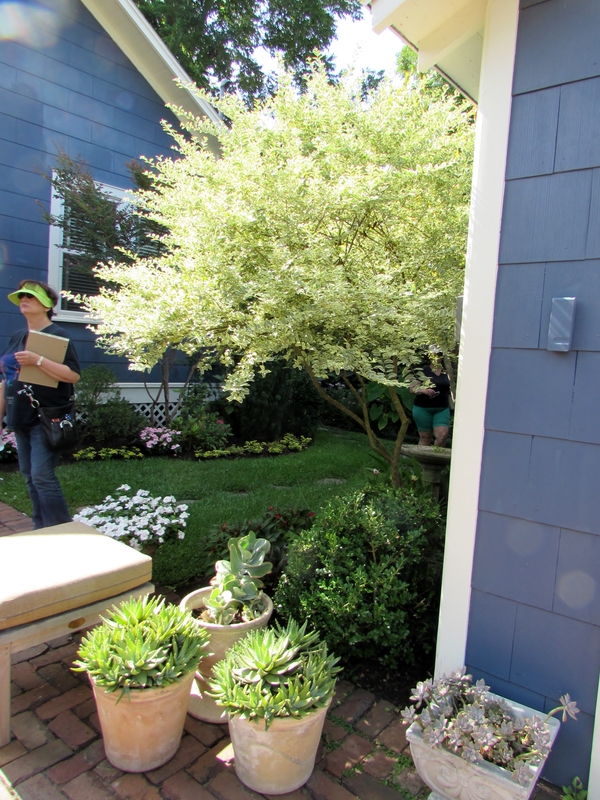 Mark works hard in spring adding perennials and annuals and changing things around each year. His Echinaceas are gorgeous. When we were here installing the bricks Mark and John asked us to source and plant a few trees. This one is a Texas ebony, Ebenopsis ebano tree. There is a large one around the corner that they admired often on walks. 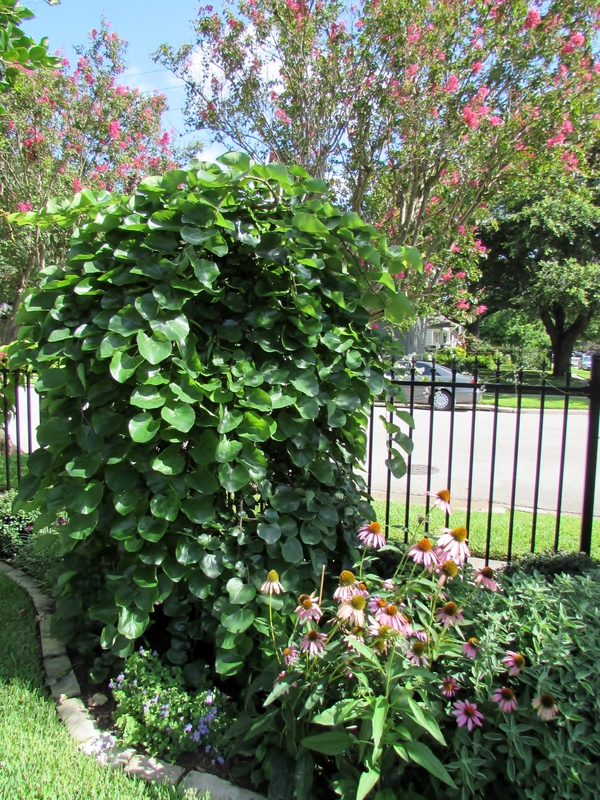 I think this makes a perfect corner tree and it has rooted in, filled out and grown several feet since we planted it. The skirt of Artemisia ‘Powis Castle‘ is a perfect contrast. 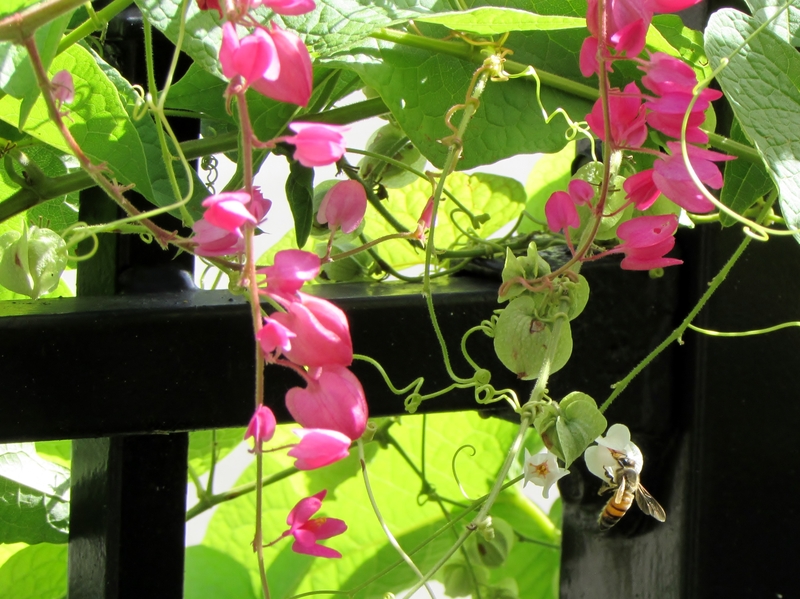 Coral Vine, Antigonon leptopus on lattice on the north fence was full of bees. I managed to catch one in this photo. 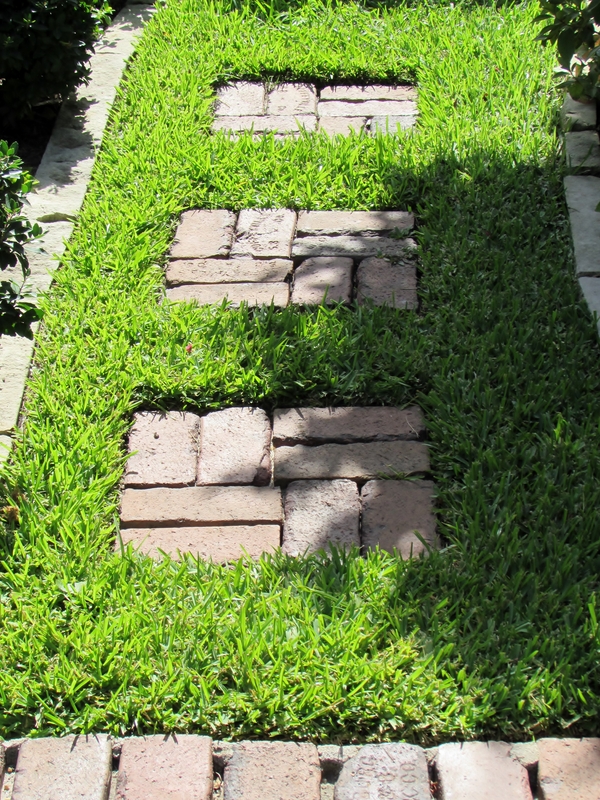 These brick pads are a transition between the grass and the path that leads down the north-side of the house and to the back patio. 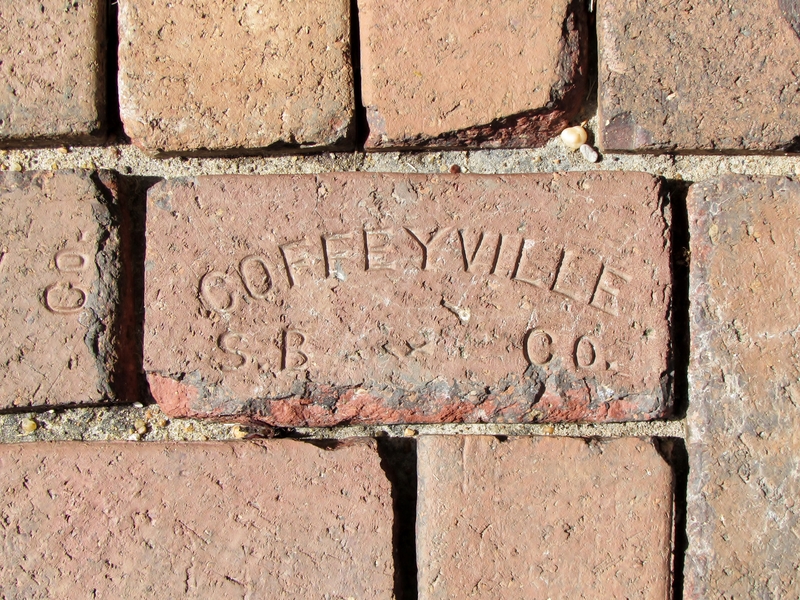 The bricks are from one of the old streets of Galveston. They are very sturdy and have a nice patina. They are set on a compacted base of sand with just the soldiers mortared in. The desire was to allow them to rut and move a bit to add character and matching the cottage bungalow, giving the sense that they were always there. They were also installed with a gentle slop away from the house as a drain away measure. 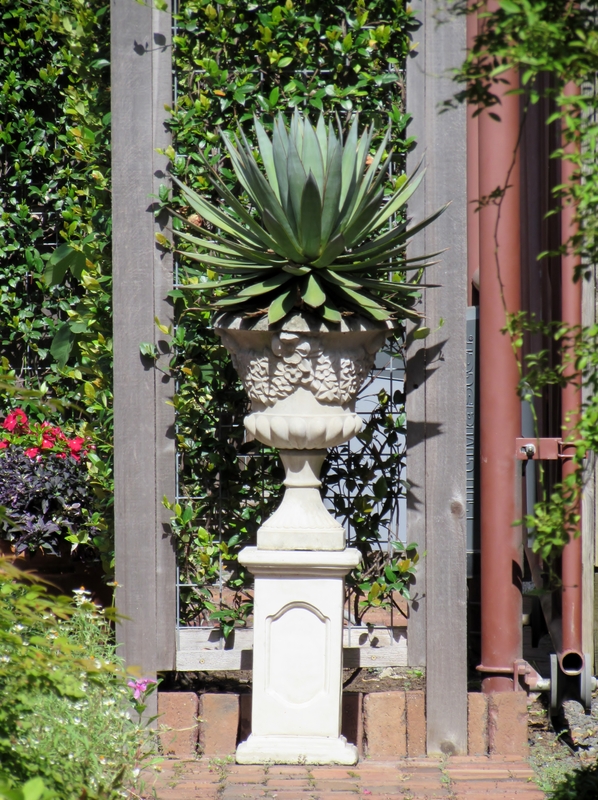 The urn with the beautiful structured yucca draws your eye to the end of the path. It also helps obscure the view of the electric gate opener. This view is looking back from where we came. I like the way bits of green are filing the cracks between the bricks. 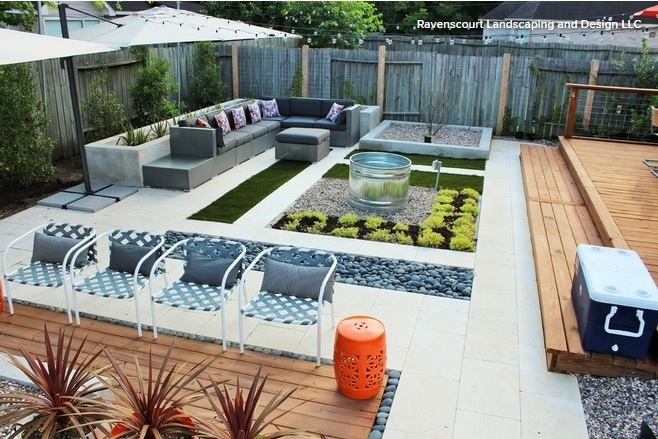 Part of the design was to put a larger deck around the back steps and create a small raised seating area. 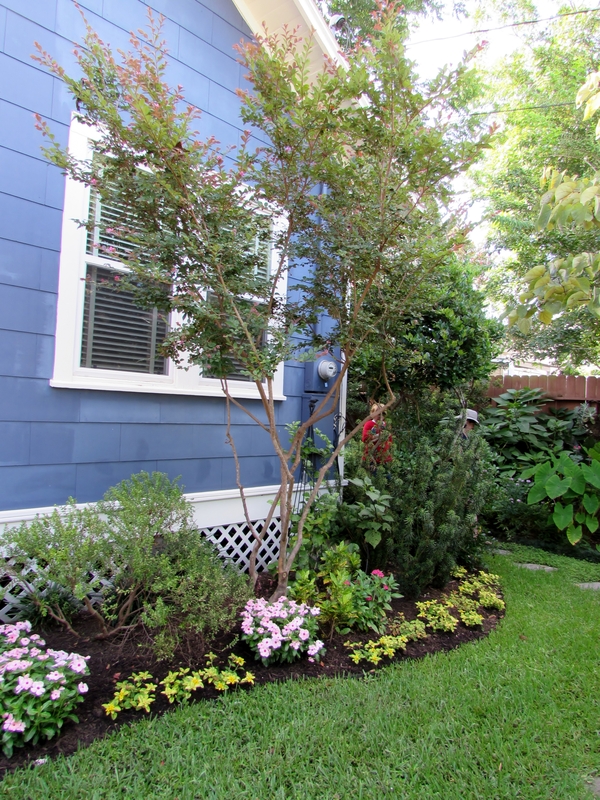 The line of the bed along the side of the house was continued adding more green in the space. 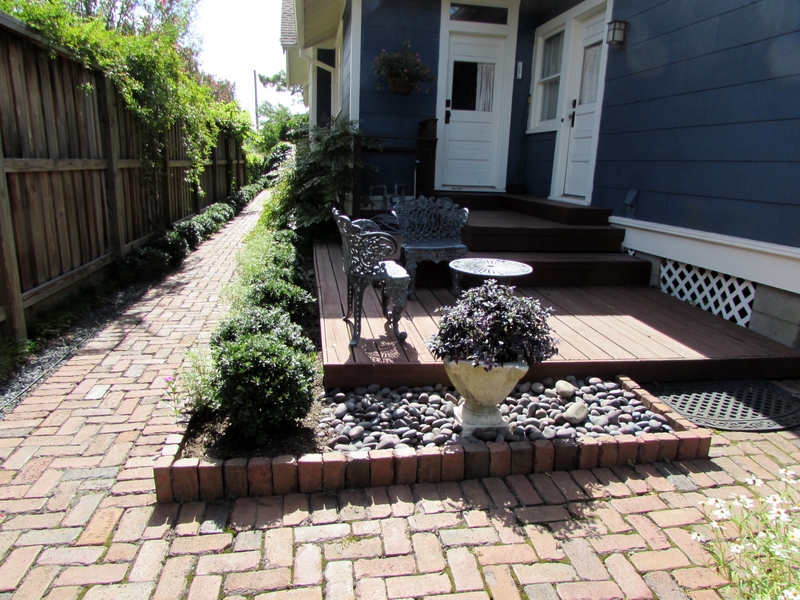 The little hedge of Dwarf Yaupon holly is low maintenance and fits the scale of the deck. 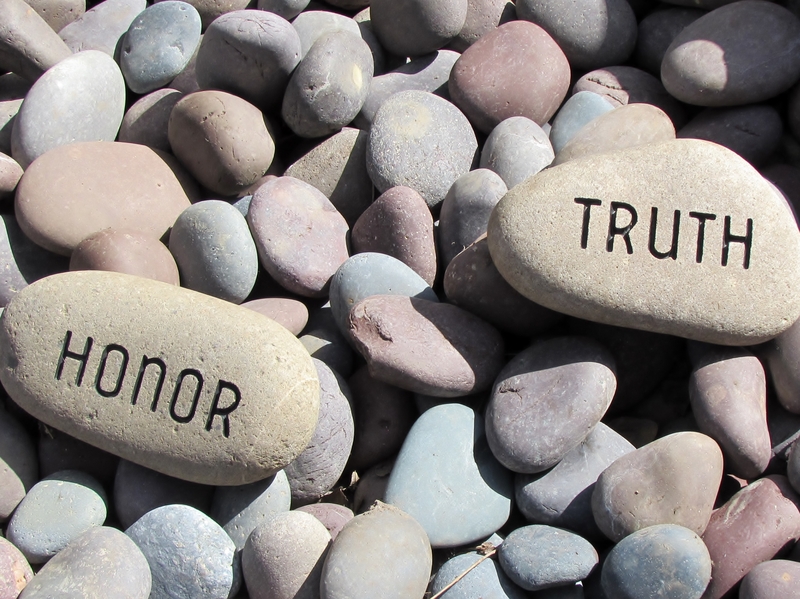 As you look closer at the rocks you find words on some. Reminders! 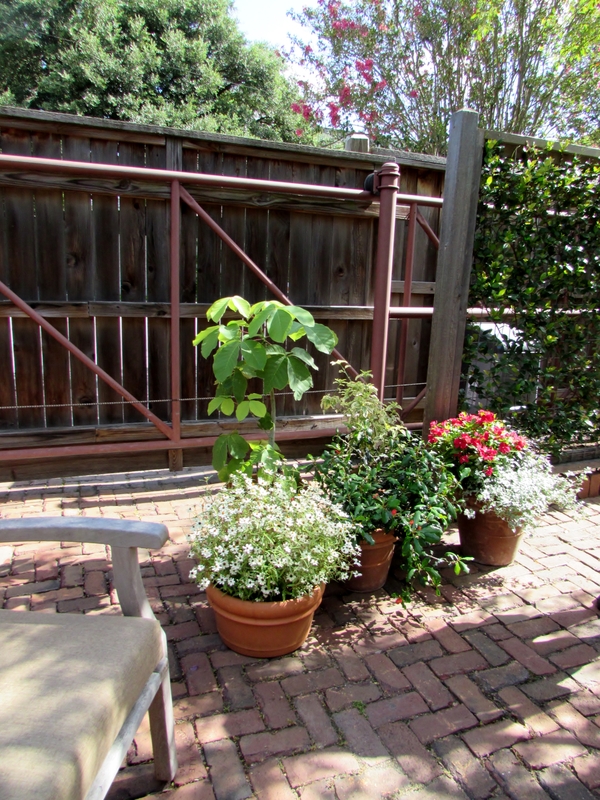 The driveway is part of the patio and when the gate is closed it becomes a nice sized space for entertaining. Multi-use is good in smaller gardens like we have in the Heights. 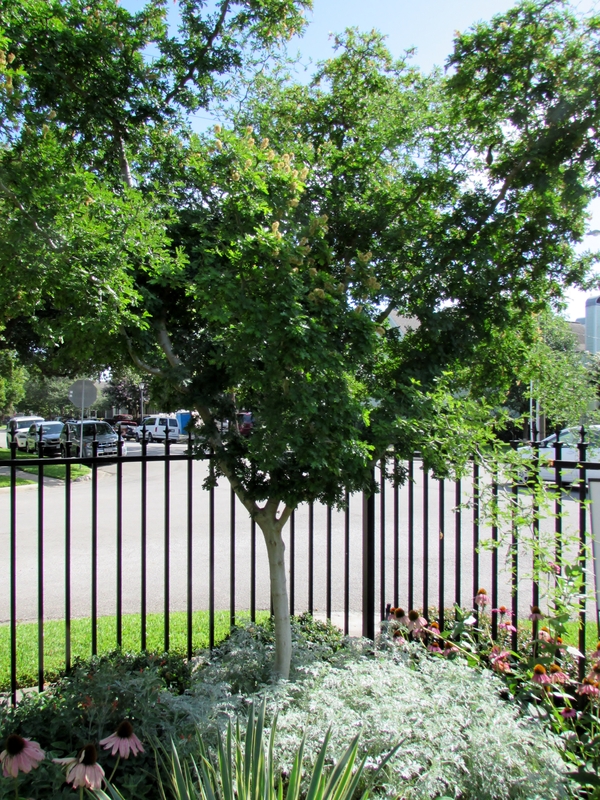 This tree is a Lacebark Elm, it was in a 45 gallon container so not small to start but now it is even casting shade : ) Mark and John were gracious host having nibbles and cool drinks for all the tour guests. This tree is going to just get better and better as it matures and give more shade in our hot summers. I enjoy the combination of pink, blue and green. 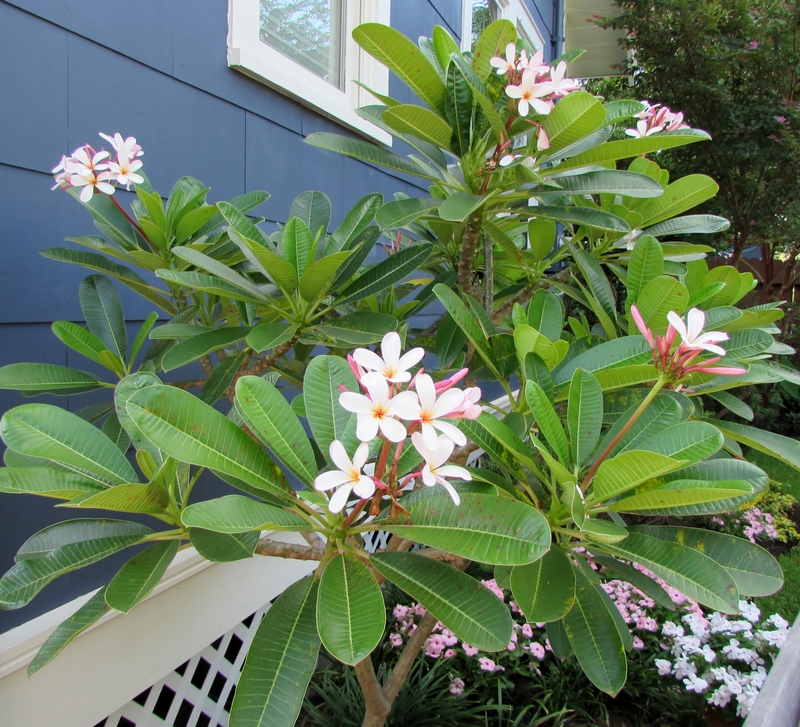 This plumeria is right on the corner of part of the patio. The view from the driveway patio. The cluster of pots softens the corner. And a limbed up Variegated Wax myrtle brightens the space. 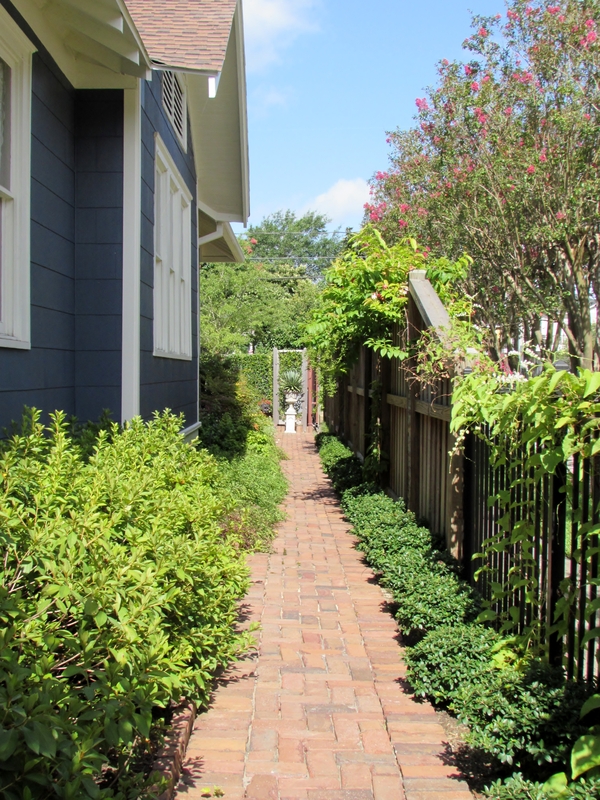 A little flagstones path lead you across the back with many of the oldest shrubs. In the back ground there is a beautiful Farfugium japonicum ‘Giganteum’ (Giant Leopard Plant), That doesn’t exactly roll off your tongue does it. I love the tractor seat sized leaves. 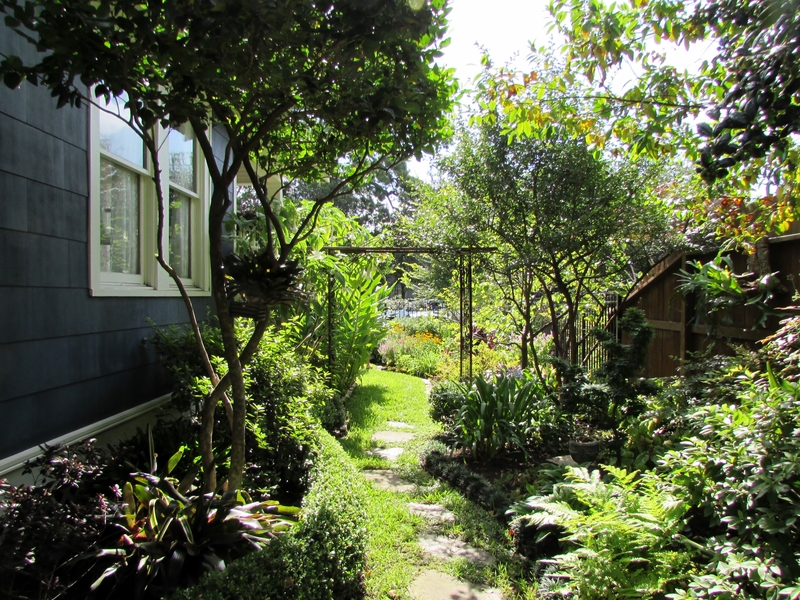 Mark and John’s garden flows all the way around their home. I found it interesting to walk around clock wise and then back around counter clock wise just to get a different perspective. An old loropetalum that has been let to grow into its natural tree form. Elephant ears, Colocasias grow like weeds here in Houston. This is not the one I see everywhere however. I like the delicate reddish color in the veins in this one. Colocasias will die back in a hard freeze but they do return. And they can spread. I have some on the north side of my house that I haven’t seen since the drought started. I am not sure if they were hibernating or these blew in on the wind. 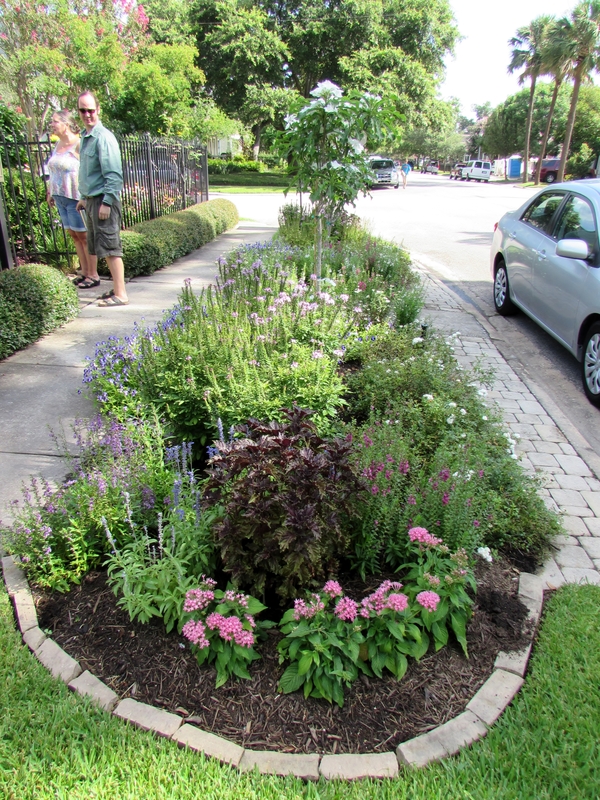 Mark uses organic solution and fertilizer in his garden making it an inviting place for birds and pollinators. Now we are headed down the south side and it is shaded by several older shubs. Here you see proof that Houston is Sub-tropical with bromeliads growing in the ground. Some are in pots tucked in here and there too. Bromeliads prefer to exist on rainwater only. Looking up we see dappled light in this mostly shade garden. I am not sure but the large ginger to the right looks like a Cardamon ginger. And just under it I believe is Bee Balm. I see now it would have been better to post sooner than later. Here is a closer look at the Bee Balm (Monarda didyma). They did well in our neighborhood this year. 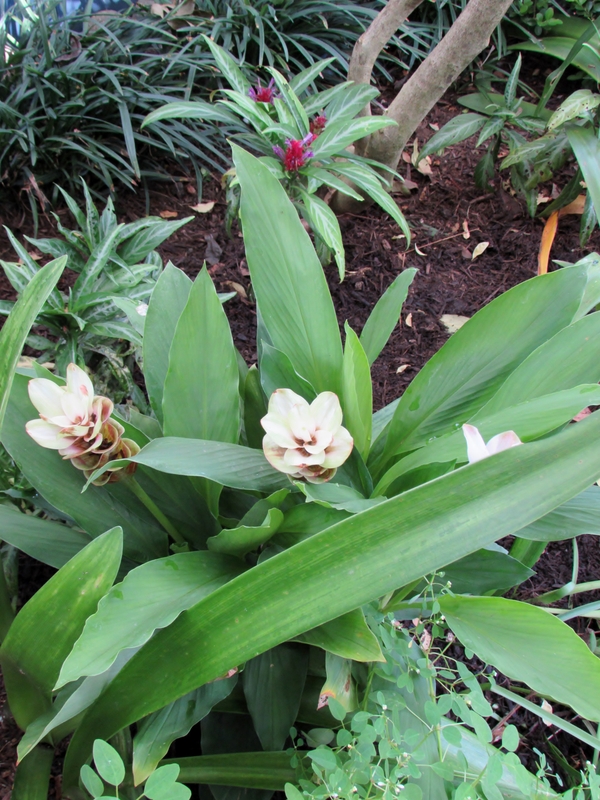 Here are some super happy Siam Tulip, Curcuma alismatifolia, also called Tulip ginger around here. 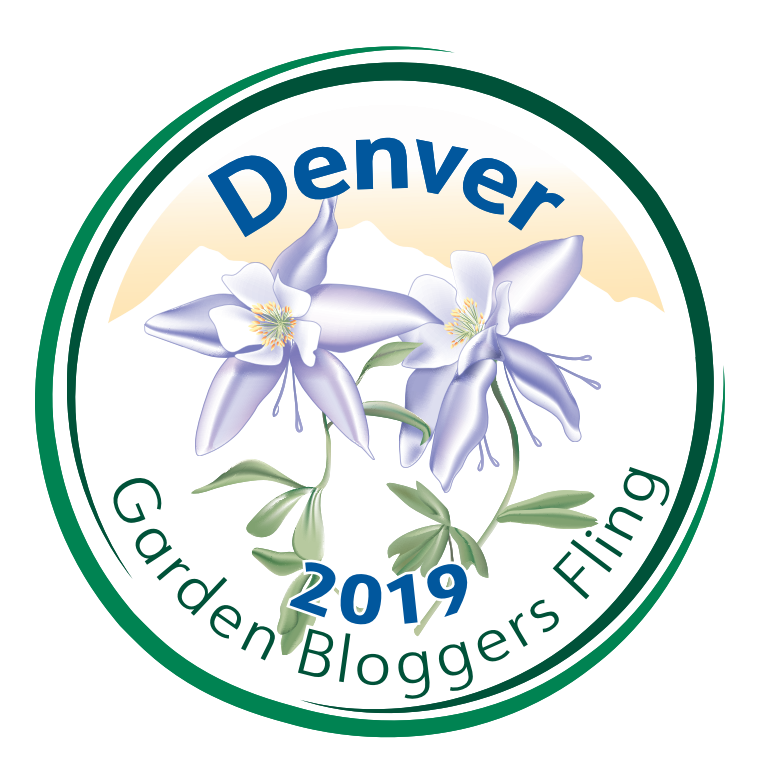 (I have been told that this is actually Cleome a perenial you can grown from seed -thank you Brenda) Check out Swallowtail Garden Seeds for a large selection of Cleome in different colors. Further along heading back to the front garden. Nice layers with fern and even a boxwood hedge. Under the arbor and back into the sunny front garden. The layers are wonderful and I think even an English gardener would be chuffed to have this lush display in their front garden. 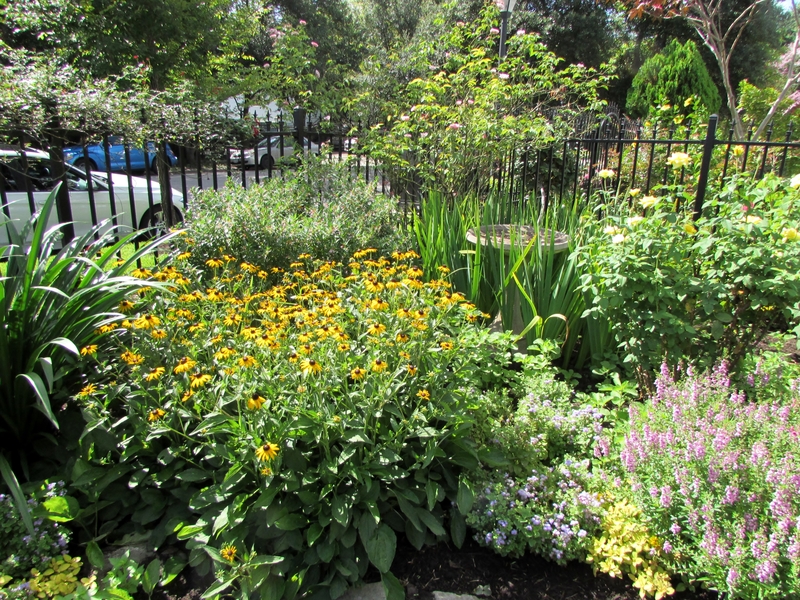 Nice deep beds with contrast in leaf color and bright bold flowers but still cool and green on a hot July morning! I hear that people stop by and linger often as they take a walk in the neighborhood. If you are fortunate to see Mark out there he might give you a tour. He has two green thumbs! 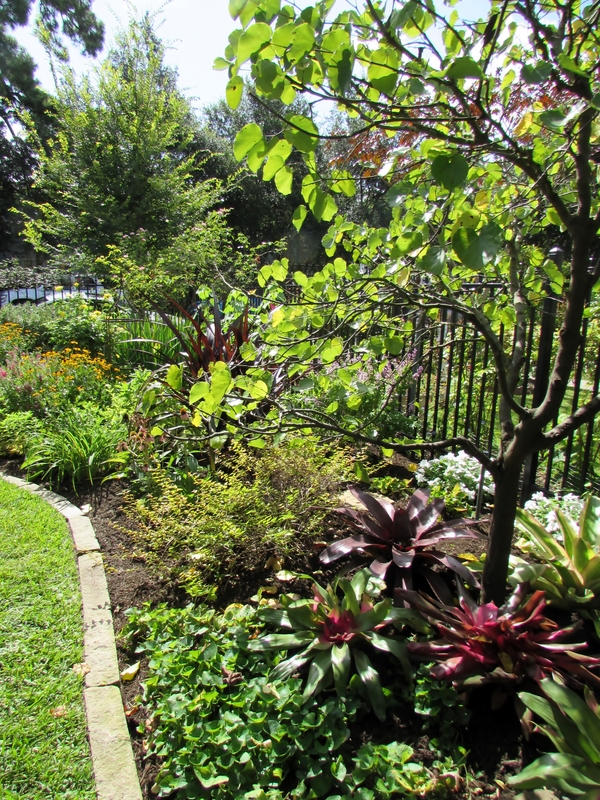 We are fortunate to have this jewel of a garden in our neighborhood! 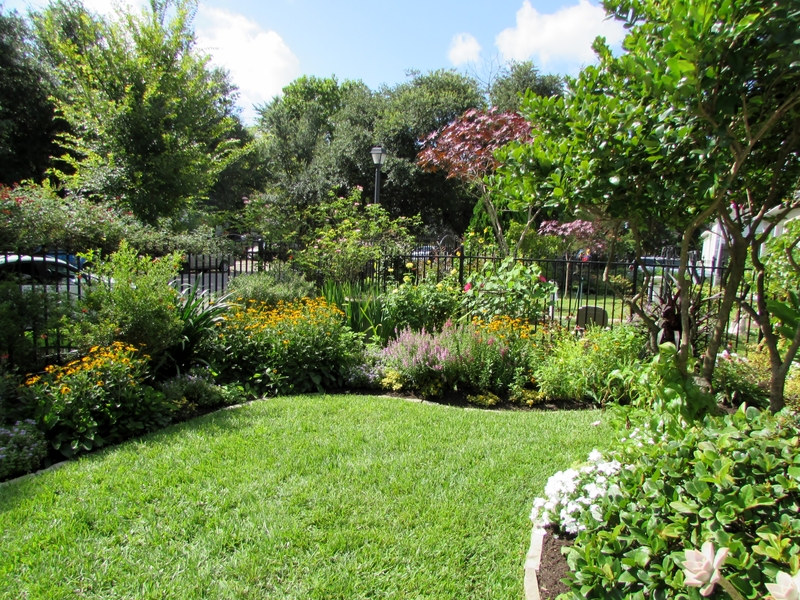 Beautiful garden – I especially l like what they’ve done with the parkway. It is a lovely garden and Mark is always changing it up. 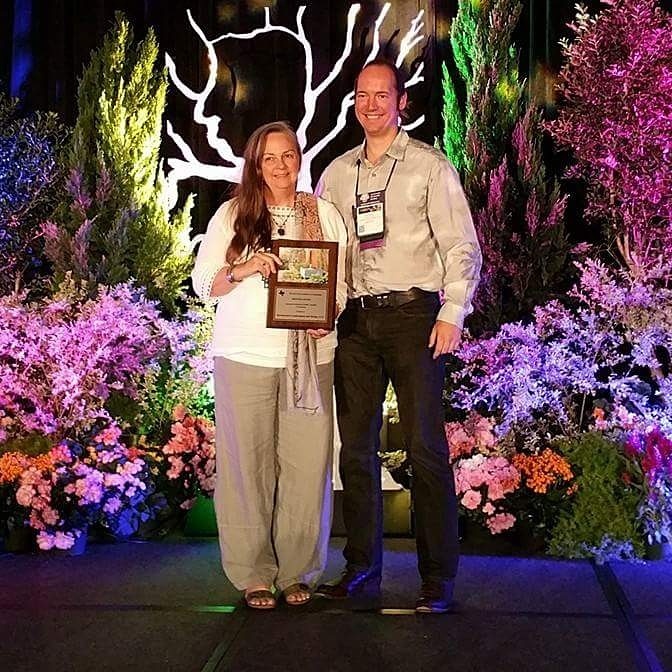 This year he told me he planted 250 tulips. The parkway is a nice welcoming design that is functional too!